IWASSA Co.: Leaking large version of the upcoming "iPad", "iPad Air Plus"
Leaking large version of the upcoming "iPad", "iPad Air Plus"
Japanese publishing news site that specializes Apple said Friday that he planned tablet computer large "iPad Air Plus" iPad Air Plus the much talked about lately Alokhirh.oely touched by the planned site "Mac Van" Mac Fan to some computer specifications which defines the media also known as the "iPad Pro" iPad Pro, where he said that the device will work processor "AT 9" A9 will be shipped between the months of April / May and June 2015. According to the site, will present "iPad Air Plus" aperture of 12.2-inch screen and will come dimensions, 305.31 × 220.8 × 7 millimeters and will the next generation of "AT 9" processors instead of "any of the 8 X" processors A8X as previously rumored. Leaking large version of the upcoming scheme tablet computer "iPad"
The Web site said that the upcoming tablet computer will present four speakers built to take advantage of stereo sound even when it is being managed. 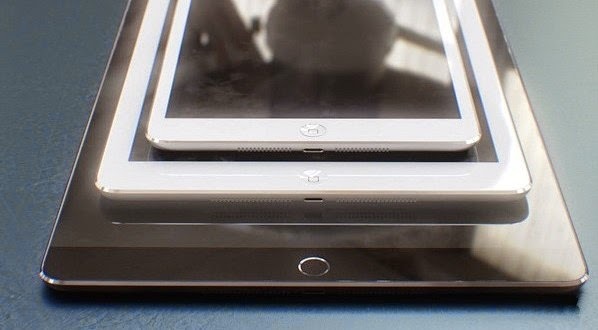 In a related context, the transfer of Mac Fan site also that Apple intends to provide fourth generation of computer tablet mini "iPad Mini" - which will also be launched next year - the processor A8X, will also provide a new design and thin near the computer "iPad Iyer 2 design." Site also quoted that, at the launch of "iPad Mini 4", Apple plans to stop production of "mini iPad" and "iPad Mini 3" to maintain a "mini iPad 2" and "iPad Mini 4". 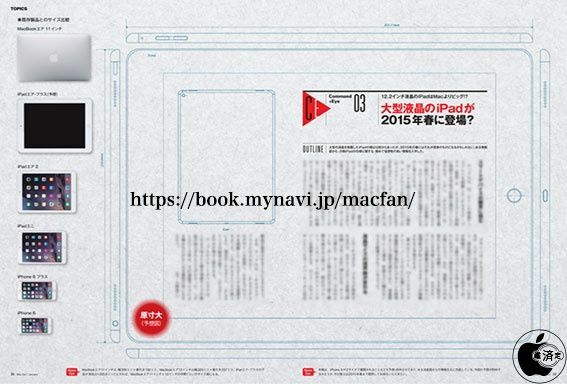 And compatible Mac Fan site with information transferred Japanese counterpart as well, "Macottakara" Macotakara known accurately Tsribath related products Apple, earlier this month. Where the Web site, "Macottakara" that the device will come measuring 12.2 inches, and unlike the previous leaks that have spread over the past few months, which stated that "iPad Pro" will provide screen measuring 12.9 inches. Earlier reports spoke of the determination of Apple's disclosure of "iPad Pro" this year, but the excess demand for "iPhone" the new mobile payment deadline to early next year.